Cosmetic Acupuncture: Look younger naturally! “While seeing Sharon for something totally unrelated, the subject of cosmetic acupuncture came up and I was willing to try it. After a couple of sessions it seemed that I was using less foundation to even out my “Irish skin”. That would be pale coloring with red blotches here and there. Along with the coloring, my pores looked smaller. Then my husband looked at me one night and remarked that I’d lost that “worried look”, the furrowed brow. Lines and creases became smoother after a few more sessions and just recently a friend of mine, bemoaning the lines from her lips, added that it wasn’t something I needed to worry about. Those creases had really diminished. Look at the difference in the grooves above and below her mouth! Her jawline is also smoother, less “jowl-y.” A 72 year-old beauty! Here she is in progress: One of her co-workers was so impressed, she started coming in, too. 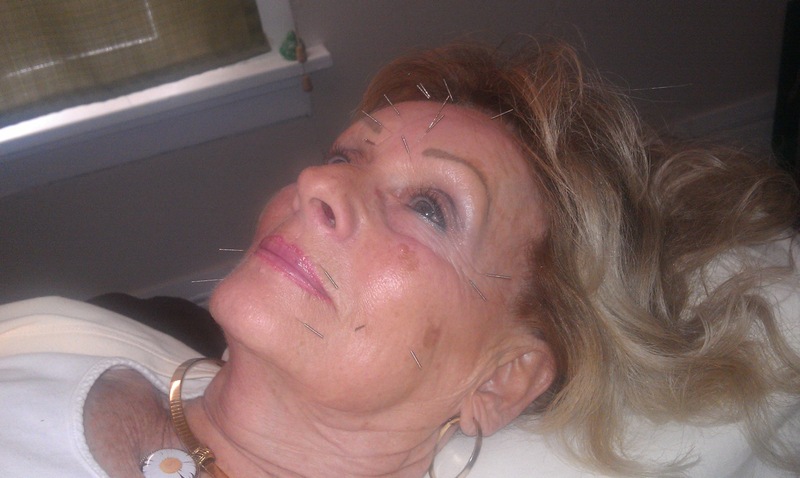 Acupuncture facial rejuvenation uses special, tiny needles at strategic points. You can expect reduction or erasure of fine lines and the softening of deeper ones. Additionally, you may experience the firming of jowls and a reduction in the size of under-eye bags. It is not unusual for clients to report enhanced skin tone, increased energy and brighter eyes. Here’s how it works: Local acupuncture increases collagen production, improves muscle tone, and reduces sagging around the eyes and neck. It helps eliminate puffiness by eliminating excess fluids, improves and evens out facial color, moisturizes the skin by increasing circulation of blood and lymph to the face, and reduces stress evident in the face. If you want a more detailed perspective on how it works, read these articles: Part 1 and 2. Part 3 is for fellow acupuncturists. Not surprisingly, if you are a smoker or sun-worshipper, you will need to make a longer commitment in order to achieve results. Session of cosmetic acupuncture only are $55 and take half an hour. You can also combine this treatment with some types of regular sessions: Please call for more information. Packages of 5 treatments are available for $245. They make a great gift, too! This entry was posted in Before and After, Healthy lifestyle and tagged acupuncture, before & after, botox, cosmetic acupuncture, facelift by Sharon Rose. Bookmark the permalink. I really liked your blog! Thanks! This worked for me! I love it!